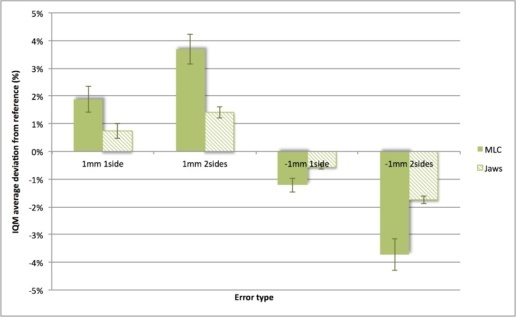 This multi-centre study aimed to test the IQM system’s ability to detect small delivery errors in IMRT plans. The researchers introduced 7 types of errors in 9 clinical step-and-shoot IMRT plans, by modifying the number of MUs and introducing small deviations in leaf positions. They delivered the original and modified plans and recorded the detector signal variations. Each centre selected a patient case for each of 3 anatomical sites, and generated 8 plans for each patient: an “error free” (EF) plan and 7 “error induced” (EI) plans. 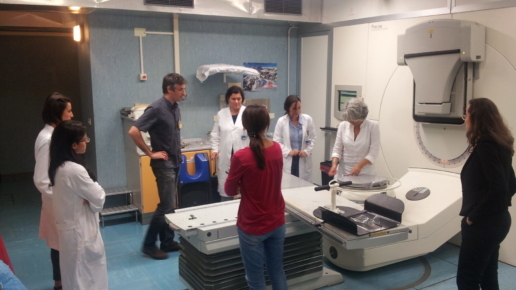 In total, the team delivered and measured 72 plans with the IQM system. They calculated dose distributions for each EF and EI plan, and determined each EI plan’s percentage variation with respect to the original EF dose distribution. They then compared the variation in the dose distributions to the corresponding variations in the recorded IQM signals for the EF and EI plans. The IQM system proved to be very sensitive in detecting delivery errors. Increasing the linac output by 1MU caused a signal increase (average±1sd) of 1.0%±0.4% in the H&N cases, 1.7%±0.4% in the prostate cases and 0.5%±0.3% in the APBI cases.. 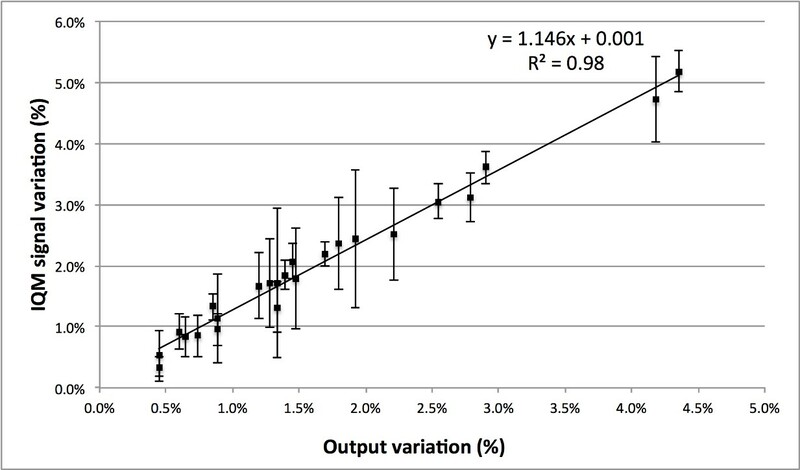 The following graph shows the magnitude of signal variation detected for the seven induced errors and clearly shows that increasing dose output deviations or MLC shifts in the EI plans resulted in greater deviations between EI and EF signals. The next graph plots IQM average signal variation from reference (%) versus output variation from reference (%) for the three errors introduced on MUs for the 3 treatment sites. IQM signal correlates linearly with output. The next graph presents an extension of the test that evaluated the IQM system’s sensitivity in detecting errors induced in the collimator jaws, orthogonal to the detector gradient. The induced MLC leaf bank position errors were repeated as collimator position errors for a prostate patient. IQM is shown to be sensitive to positional variations in the orthogonal direction with respect to gradient, although the sensitivity is, on average, 1.5% less than for positional variation in the detector gradient direction. 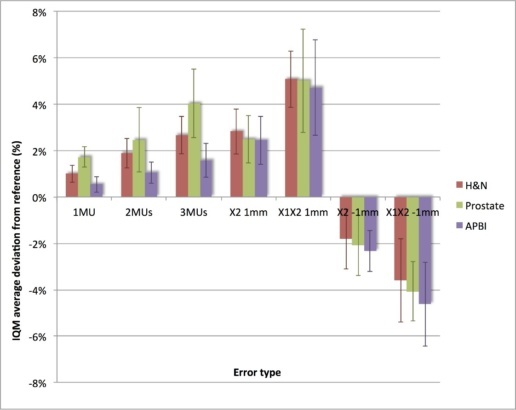 The IQM detector is capable of detecting small delivery errors in MU and MLC leaf position and shows a high sensitivity for clinical practice.